(1/7) I have a new publication out for the Oklahoma Council of Public Affairs (OCPA), titled “How to Increase Labor Force Participation in Oklahoma.” I hope you’ll give it a read. Labor force participation is truly one of the defining issues of our time. From the Left: Vox’s “The Weeds” podcast. More from Ezra Klein here. From the Right: National Review’s “The Editors” podcast. From the Right: Wall Street Journal editorial board. From the Center: KCRW’s “Left, Right, & Center” podcast. From the Center: The Economist x2: Take One & Take Two. From the Center: the Five Three Eight Politics podcast. From the Center: The Pollsters podcast. (4/7) Developing details and speculation about trade policy inside the Trump Administration from Greg Ip of the Wall Street Journal and also The Economist. (5/7) A few interesting data visualizations on the international economy. First, embedded in the tweet below, a look median age across nations and over time. 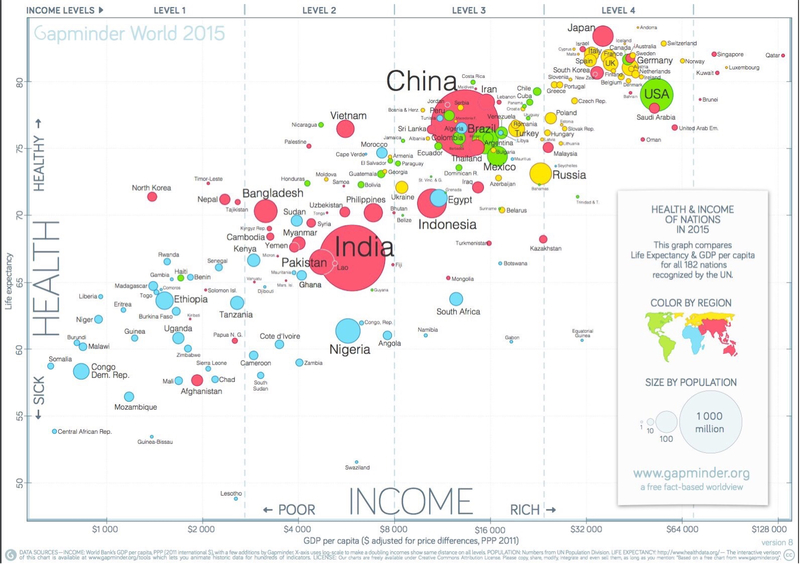 From GapMinder, a plot of national income, national life expectantcy, and national popopulation. The Economist looks at income distribution in China, India, and the United States. (6/7) Goldman Sach’s podcast recently discussed “fintech,” touching on the market generally and Goldman’s specific efforts. The podcast is a good introduction on the consumer finance & lending side of the market and the World Economic Forum blockchain primer priovides a good introduction to another notable facet of the fintech space. IBM’s CEO is very bullish on blockchain technology. CB Insight has tracked fintech start-ups, noting big, traditional banks have joined in—it’s not just future-oriented venture capital funds in the game (see here and here). See charts below from CB Insights work tracking fintech in conjunction with KPMG. On bitcoin, I’ve previous recommended Jerry Brito’s Mercatus Center primmer on bitcoin and Marc Andreessen’s 2014 NYTimes article describing why he’s bullish on Bitcoin—still great resources. (7/7) Speaking of Andreessen and on the topic of venture capital, the Andreessen-Horowitz “a16z” podcast looks at how public policy affects start-ups (with help from the sector’s trade group and advocate to government)—covered conceptually, recently, and prospectively towards the 115th Congress and Trump Administration (embedded below). Also relevant, Wall Street Journal coverage on early 2017 IPO activity—see chart below.